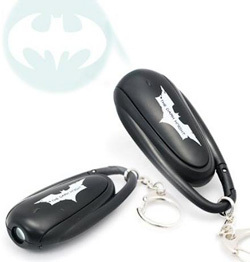 The Dark Knight Bat-Logo Projector Key Ring | OhGizmo! I have to say I’m a bit confused by this Dark Knight projector key ring. My first guess was that someone had a warehouse full of LED flashlights left over from the old, pre-Nolan Batman films, which would explain why it projects the old Batman logo. But since Batman & Robin (shudder) dates back to 1997 when cheap LED flashlights didn’t exist, I’m at a loss. So my second guess is that this is simply a crappy Photoshop job and whoever put together this product shot couldn’t find a version of the new bat-logo to use. (Even though it’s used on the projector itself.) At least that’s what I hope is going on here. It would be pretty crappy to pick one of these up only to find it does project the old bat-logo for some reason. If I was in trouble and desperately needed Batman’s help I would much prefer the Christian Bale version to show up, instead of the George Clooney one. You can get it from Play.com for about $16.